Hua Hin is not the first place that comes to mind when dreaming of Thailand as a holiday destination. Usually I hear people speak of Bangkok, Phuket and the islands. Just a three hour drive from Bangkok airport, Hua Hin is a seaside resort city, popular with both Thai locals and foreigners. It retains local charm in many areas and is quieter compared to better-known places such as Phuket. Hence Hua Hin is also popular with retired expats and foreigners seeking holiday homes. But don't let 'retired' taint your perspective of Hua Hin. There is plenty to do for every type of holiday goer. Except skiing perhaps. Okay, every type of sunny holiday goer. Here are my top five. Full post about this magical place coming soon. But for now all you need to know is Hutsadin Elephant Foundation is a sanctuary where the animals are well-treated and well looked after. If you'd like to meet these beautiful creatures (who wouldn't) you can happily spend your money here knowing you are helping the animals live a happy life. 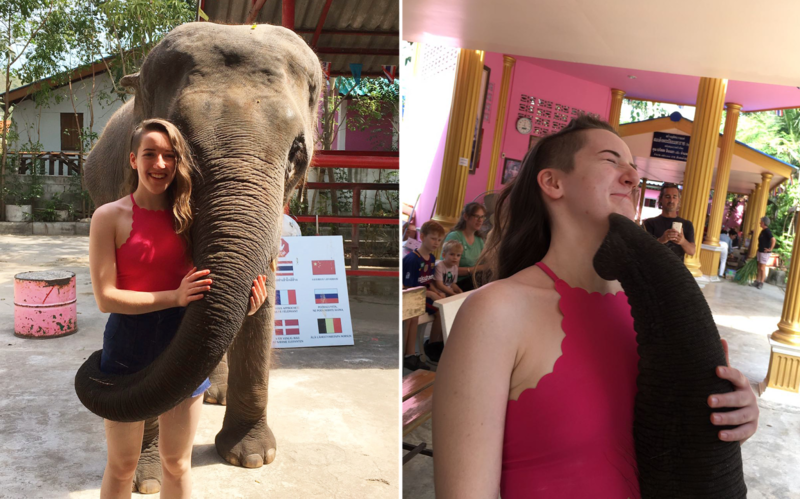 And you can get an elephant hug (see left) which is perfection, and an elephant kiss (see right) which is smelly perfection. The two beaches I visited were Hua Hin Beach (top) and Suan Son Pradipat Beach (bottom). Two very different beaches. That rock you can see faintly in the distance in the bottom photo is the same rock up-close in the top picture. Hua Hin Beach is definitely the most crowded and commercialised beach. Loungers are available for cheap, there are bars, jet skis and banana boats. Indeed, this was my first time on a banana boat and I absolutely loved it. The first time falling off was a tad scary, but afterwards it was just hilarious and I honestly haven't laughed that much in a while. The second beach, Suan Son Pradipat Beach, is a lot smaller and quieter than the first. I believe it is not known to most tourists, which means you can have it all to yourself. Luckily not that many people read my blog, so it shouldn't be crammed full anytime soon. The water was crystal clear and the beach was so secluded with a couple of beautiful beach houses by the shore. I'd love to live somewhere like this. I will admit however, there were a couple of washed up dead fish (but only a couple) and I did photoshop one out in this photo - forgive me. But if you go to the sea, you can't be shocked to also find fish. It's a sacrifice I'd be willing to take for the dreamy sparkling water. What we thought was going to be a gentle, flat trail to see a pretty cave at the end turned out to be a crawling, climbing and squat-walking expedition alongside jumping camel crickets/spiders and bats in complete darkness. Have I sold it to you yet? Although I was thoroughly surprised by Kaeo Cave, I actually did enjoy the adventure and felt very accomplished afterwards. If you like to be more active on holiday, this is the cave for you. Just be sure to wear trainers or shoes with good grip, bring a backpack if possible and be sure to rent out the head torches available at the gate where you pay to enter the National Park (about £4 each). And PLEASE bring a water bottle! You will not regret it. If you like Buddhist temples, stairs and monkeys, then this will be your favourite place on earth. Ever. And even if you only like one of those three items, I still recommend you go. This isn't a whole day event, but it's a beautiful place to visit. My favourite part (well except from the monkeys of course) was reaching the top of the stairs to the temple, and taking in the beautiful views of Thailand below. I felt very lucky to be able to stand there and appreciate it fully. 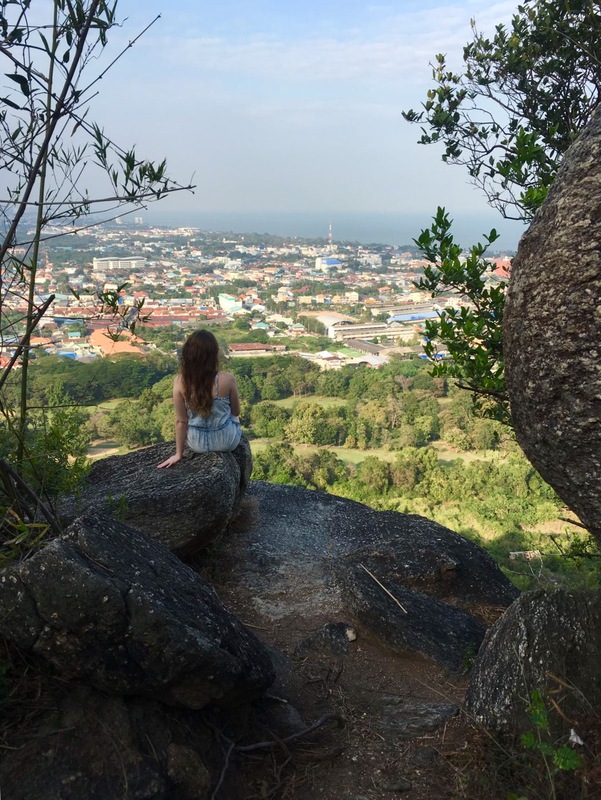 If views are to you what eggs benedict is to me, get yourself to Hin Lek Fai View Point, where there are several trails leading further up to different viewpoints, such as this one and the first photo in this post. Aside from these 5 activities, I would recommend a Thai massage which are usually about 400 baht or £9 for 1 hour. You're on holiday - indulge yourself. Vana Nava Hua Hin Water Jungle is an excellent waterpark (the first one I've ever been to!) and although I didn't visit Black Mountain Water Park, I have heard only good things. There is a night market with seafood stalls, clothes and other touristy things, but as I don't like seafood I didn't frequent here. Oh and if you're vegan (or like vegan food), get yourself to Hua Hin Vegan Cafe and Wine for a wide selection of Western and also Thai vegan dishes. I am so happy I made the decision to visit my friend and just bought the plane tickets. It was an amazing experience and I'm pretty sure the travel bug is a permanent and very welcomed resident now. I hope the start of 2018 is going well for you!